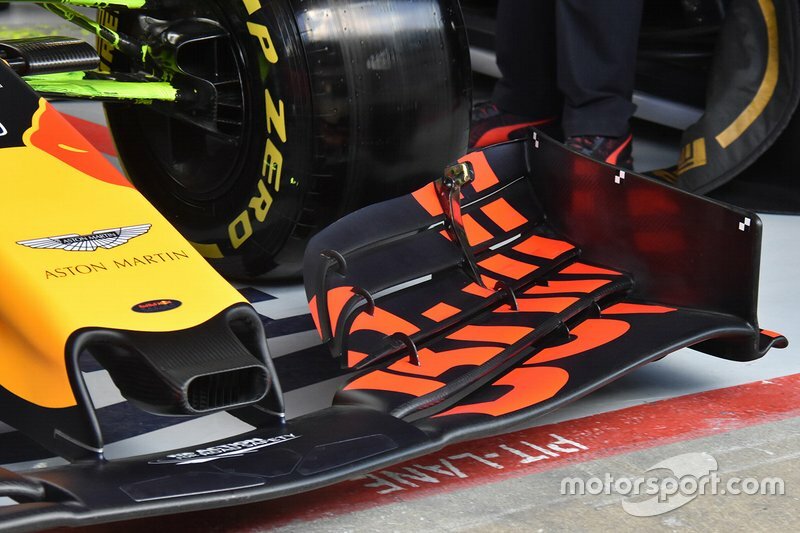 Formula 1’s new 2019 regulations have resulted in an intriguing divergence when it comes to the design of front wings. 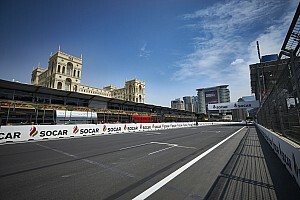 For the first time in years, there has been a dramatically different approach from teams about how best to approach the regulations – with some outfits moving away from a conventional design. 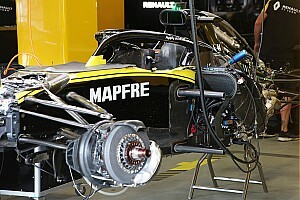 The regulation changes were made with the intention of reducing the front wing’s complexity and the ‘outwash’ they generated. If successful it would alter the entire aerodynamic wake profile of the car and allow for a chasing car to be less affected by the lead car, in order that they may stay within close proximity and affect a pass. The change in regulations have not only resulted in wider wings and the endplate being placed further out, they’ve also sought to limit or eradicate many of the outwashing elements that had cropped up over the last few years. With these tools taken away from them, the teams have continued to search for ways to recreate it. As such we see a wide array of solutions up and down the grid, with some more aggressive in their search for outwash than others. 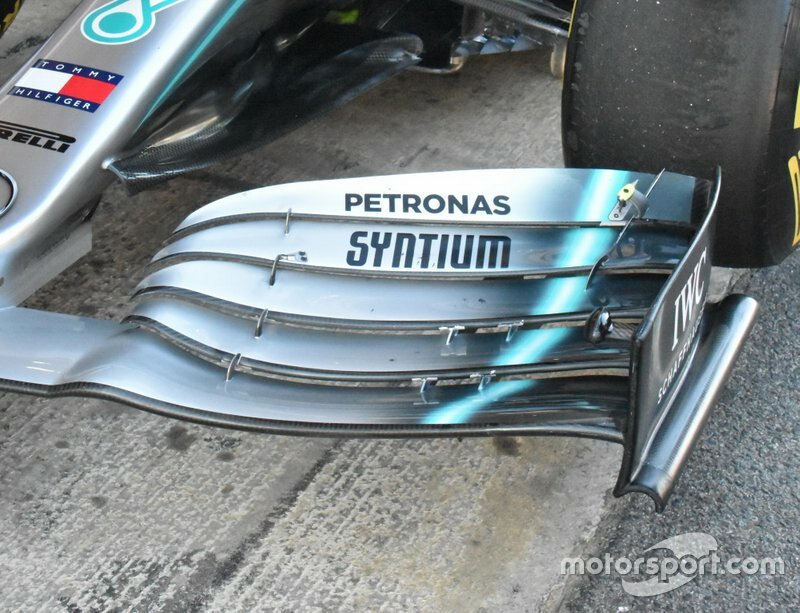 The Mercedes solution is one of what you would consider the more conventional options, with five full height flaps that traverse the wings entire span all the way to the top edge of the endplate. The flaps, under wing strakes and slot gap separators are all shapes or angled in a way that push flow outward. 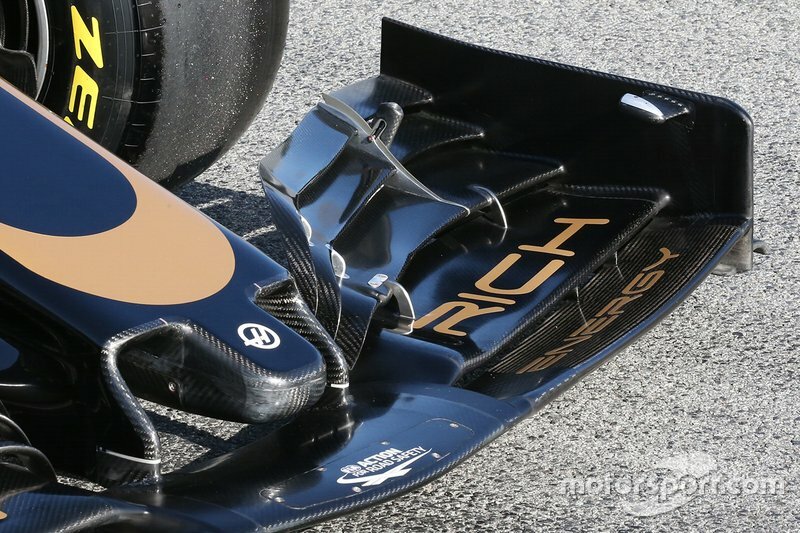 It has broken the mould when it comes to the endplate though, as rather than be angled outward it kicks in at the rear, perhaps forcing a larger flow structure to propagate. 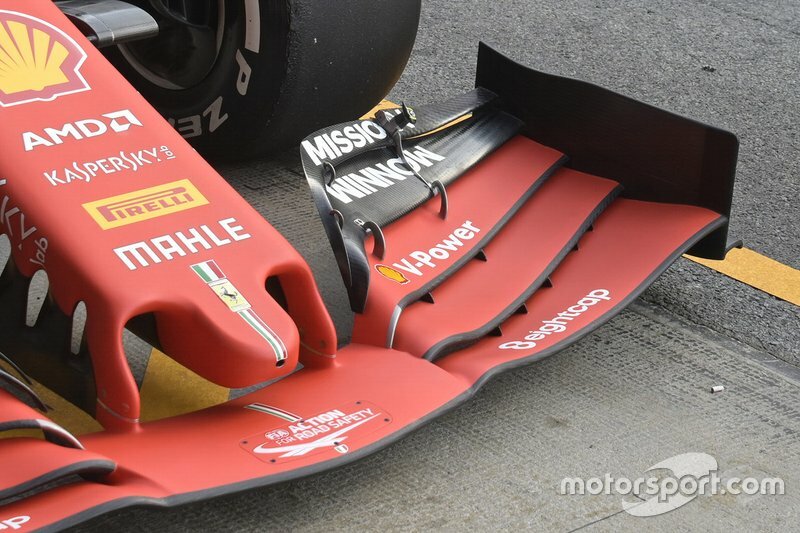 Ferrari has chosen a more drastic design route, shaping the upper flaps so that they taper away towards the endplate. 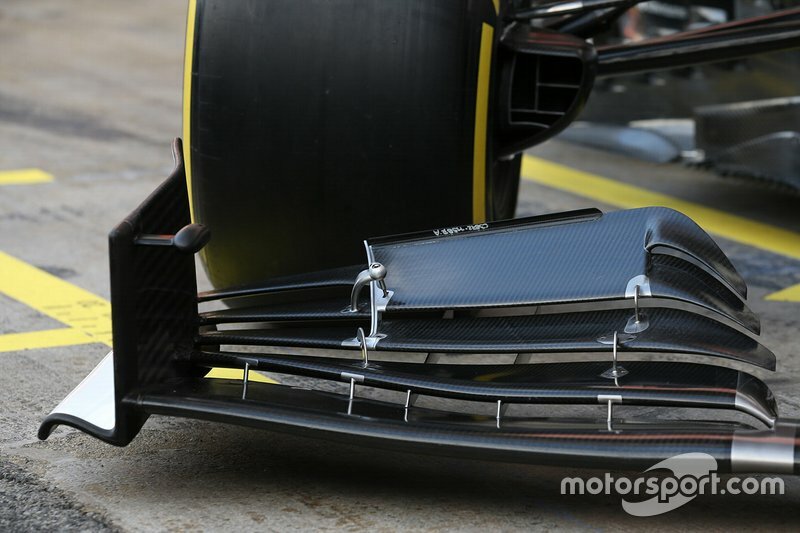 The endplate is angled out too, as the team look to drive as much airflow outboard as it can. Red Bull has opted for the more conventional option, with the full span flaps angled up toward the top edge of the endplate. It hopes to use the flap, wing adjuster, slot gap separators and endplates design to drive flow both up and around the front tyre. 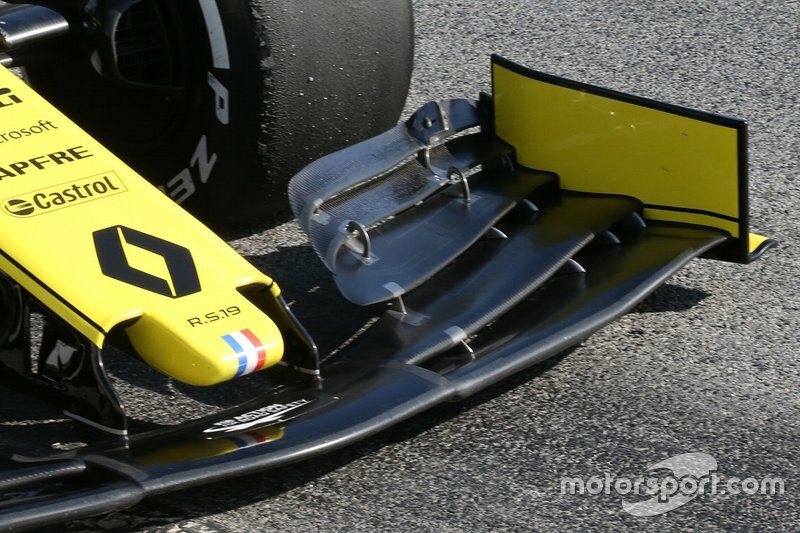 You’ll see from the shape of the flaps and their anchor position on the endplate that Renault’s design is what you’d consider a halfway house approach. 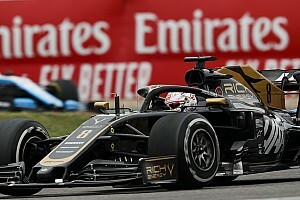 Haas too has this middle-of-the-road solution, albeit it has opted to use a pronounced and outwardly angled wing adjuster in order to compartmentalise the various roles that the wing undertakes. 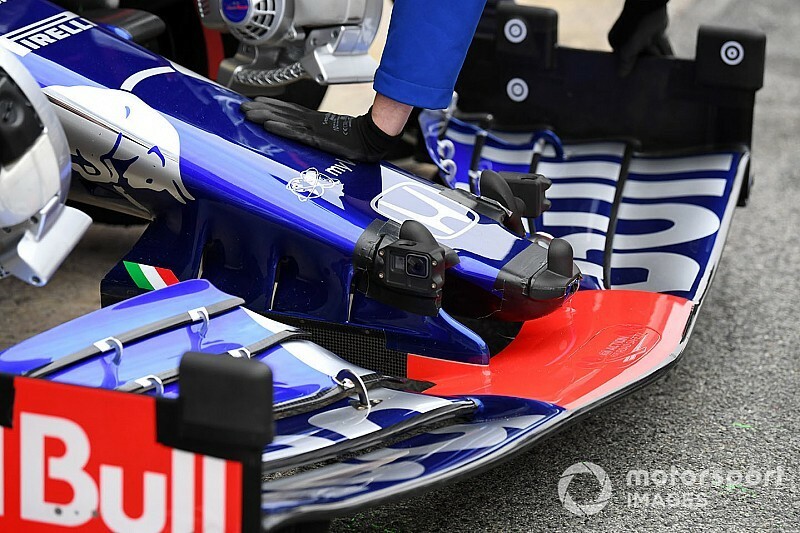 Toro Rosso has a more aggressive solution, with its flaps angled down and flattened out as they meet with the endplate. This helps to drive the flow outboard as part of their working relationship with the raised leading edge on the mainplane, which is also used to expose the twin under-mounted strakes and a footplate mounted at the base of the endplate. 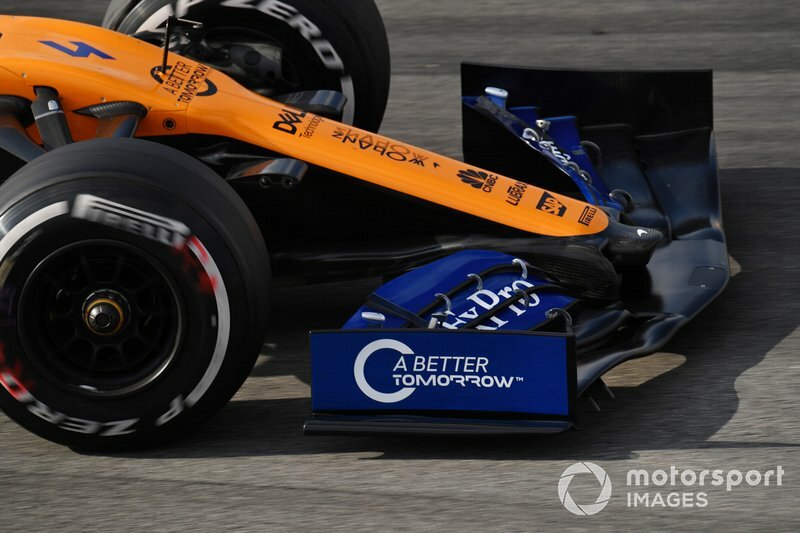 All of the teams have opted to raise the outer section of the mainplane to help circulate airflow and use the inner edge of the footplate as a sort of air skirt, but McLaren’s approach is perhaps the most aggressive. 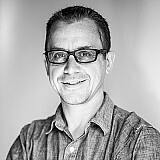 It’s a decision that’s been made with the consideration of its underwing strakes too, as they are shaped and reach forward more so than any other teams do. 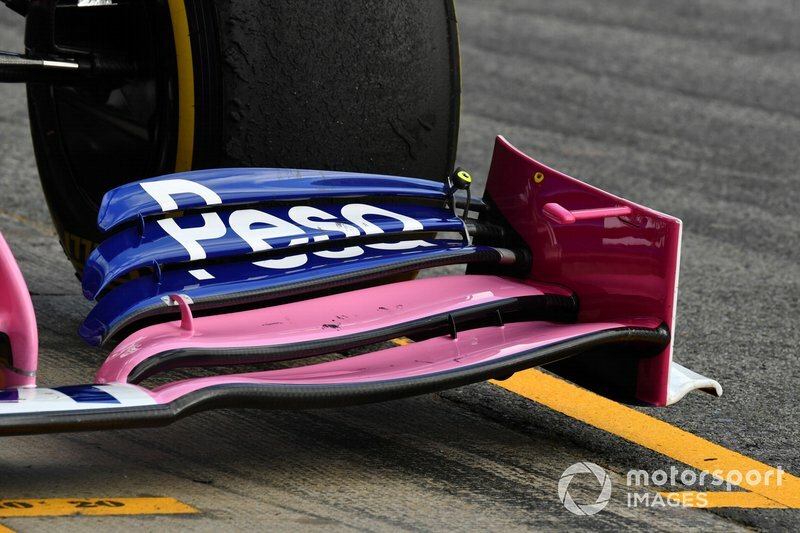 The upper, outermost section of the flaps do droop down but only momentarily and certainly not with the same vigour as the likes of Alfa Romeo, Ferrari or Toro Rosso. Racing Point has admitted that the specification that we see the RP19 running at pre-season testing in Barcelona will be vastly different from the one that rolls out for FP1 in Australia. 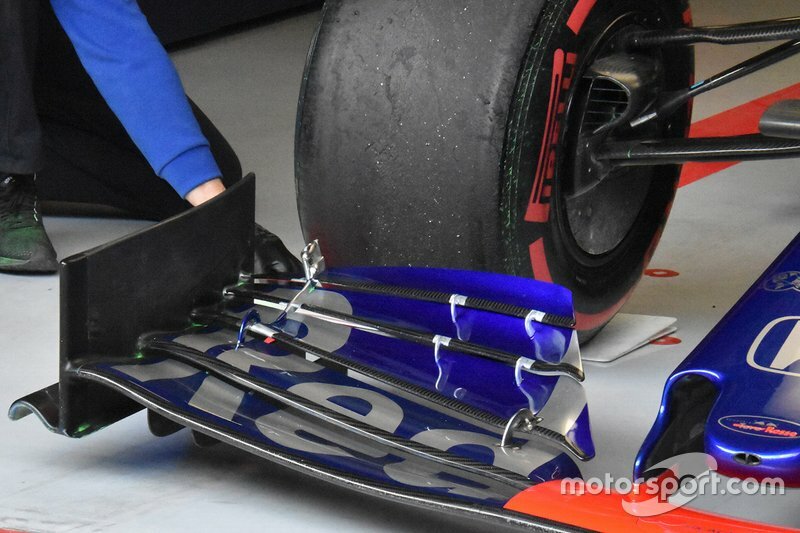 The front wing used by the team is also pretty similar to the one we saw them test back in Hungary last season, with the now limited five flap design running the entire span of the wing to the endplate. However, where it differs is that it has taken what could be described as a halfway house solution, with the three uppermost flaps tapering off and flattening out as they reach the endplate. Alfa Romeo has decided that fortune favours the bold, as its wing takes the concept seen on the Ferrari and Toro Rosso and goes even further. It has completely compartmentalised the wing, with the uppermost flap of the stack only having a short slot in it, rather than a full length one. This is in order for the flap to behave in a specific way, whilst getting the vortex shedding effect at the tip to help shape and control the Y250 vortex. Outboard of the wing adjuster (which will only add or reduce angle on inner flap stack) the flaps flatten and swoop down dramatically toward the base of the outwardly angled endplate, forcing as much flow as possible across and around the front tyre. The footplate arc also starts out quite wide and tapers off at the rear, while a Gurney tab resides atop it to create an adverse pressure gradient. 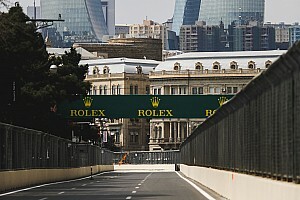 Fears of a single design philosophy being seen at the front end of the cars this year, owing to the restrictive nature of the regulations, have certainly been cast aside as the cars hit the track in Barcelona. As whilst you can almost split them up into two distinct camps there’s actually enough design differentiation to suggest we actually have nine individual design concepts, with Williams likely bringing a tenth when its full aerodynamic package appears.